Clinopodion hortus. 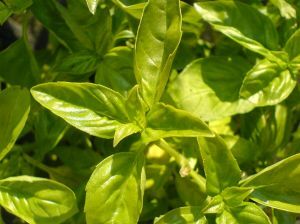 The greater or ordinary Basil is cultivated in gardens, on account of its fragrant scent. It rises up with one upright stalk, branching forth on all sides, with two leaves at every joint, broad and round, yet pointed, of a pale green colour, a little snipped about the edges, and of a strong healthy scent. The flowers are small and white, of the same shape as those of the dead nettle; they stand on the upper parts of the branches in loose spikes. The Wild Basil is similar, but not so fine as that which is cultivated. This plant is but little used, but it deserves to be. A decoction of the leaves is a good remedy for all obstructions. No plant has such efficacy in gently promo�ting menses, and the disorders caused by their obstruction. It may be used in infusion. It arrests vomiting, and allays nausea. The infusion of the seed is a remedy in gonorrhea and nephritic affections.